Post-race updates from the MX1 and MX2 classes at rounds seven and eight of the 2018 Pirelli MX Nationals, direct from Ranch MX in New South Wales. Moto two of the Pirelli MX2 class this morning to complete round seven saw Kiwi Hamish Harwood (Davey Motorsports KTM) take a wire-to-wire win, marking his first of the season. He edged out Aaron Tanti (Complete Parts Kawasaki Racing) by just 0.655s, with Jay Wilson (Yamalube Yamaha Racing) directly behind him in P3. Fourth marked another strong performance from Dylan Wills (DPH Motorsport Husqvarna), as yesterday’s winner Wilson Todd (Serco Yamaha) had to settle for fifth this time out. The top 10 was completed by Kyle Webster (Penrite Pirelli CRF Honda Racing) in sixth following a mechanical in moto one, Kaleb Barham (Mladin Racing Husqvarna) who was also a non-finisher yesterday, Cody Dyce (Empire Motorsports Yamaha), Jayden Rykers (Raceline Pirelli KTM) and Kale Makeham (Penrite Pirelli CRF Honda Racing). Overall for the round with a 3-2 scorecard it was Tanti who took his second victory of the year, a point ahead of Harwood and championship leader Todd. A breakout performance from Dylan Long (CDR Yamaha Monster Energy Team) saw him take off from a hole-shot to capture the MX1 moto two victory. Long got out front from the outset ahead of reigning champion teammate Dean Ferris (CDR Yamaha Monster Energy Team) and extended his advantage from there to 4.513s by race’s end. Behind him, Ferris rode a calculated race to second, as Luke Clout (KTM Motocross Racing Team) took third. The field was reasonably wide-spread for a 20-minute moto, as Brett Metcalfe (Penrite Honda Racing) crossed the line fourth, from New Zealand import Rhys Carter (Complete Parts Kawasaki Racing), who replicated his result from race one. 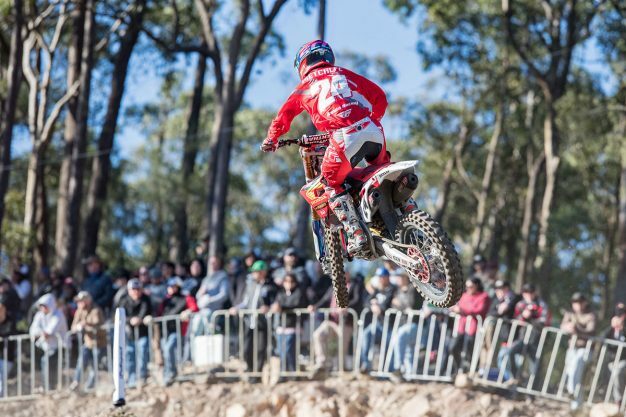 Positions six through 10 were filled by Mitch Evans (Raceline Pirelli KTM), Corey James (KSF Ecstar Suzuki), Callum Norton (Penrite Honda Racing) and Joel Wightman (Honda Genuine Ride Red). Overall for round seven, Ferris continued his perfect season atop the round podium, from Long and Metcalfe. Round eight for each of the classes consist of shorter back-to-back motos and there was no denying Todd a commanding moto victory to commence the afternoon. Todd rode away on the opening lap and controlled the seven-lap race from there, going on to win with relative ease by 5.220s. Wills managed a pass on Harwood in the final corners of the race for the runner-up position as they finished in that order, closely followed by Tanti and Wilson in formation. 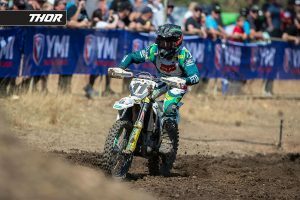 It was a stronger showing for Jy Roberts (Husqvarna) in moto three of the weekend, as Makeham, Dyce, Rykers and Richie Evans (Yamalube Yamaha Racing) were the top 10. 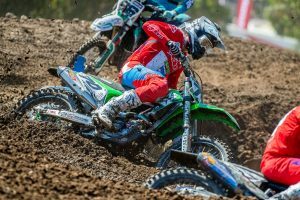 Following a five-minute break in between, the MX2 class was straight back on track for their final moto, in which Wills sprinted to a deserved 2.808s race win and clinched the overall in the process. It was a popular result for the New South Welshman, holding Todd at bay for the duration and delivering in what had been a turbulent week for his DPH Motorsport crew. The action was once again tight-knit toward the head of the pack, with Tanti improving to third, followed by Wilson. It was the best ride we’ve seen from Evans in some time for fifth, as Dyce, Harwood, Rykers, Makeham and Cooper Pozniak (Yamaha) completed the top 10. Overall for round eight it was Wills who came out on top, joined on the rostrum by the ever-consistent pair of Todd and Tanti. The opening premier class race of round eight was once again led from start to finish by Long, in a continuation of his form from earlier today. Long got out front early, despite an added challenge from teammate Ferris, and remained composed from there to win by 1.227s from teammate Ferris. Behind them Metcalfe managed to finish third, turning the tables on Clout this afternoon, who was fourth. Next came Evans in fifth, followed by Ward, Carter, Norton, James and Lachlan Davis (Honda Genuine Ride Red). 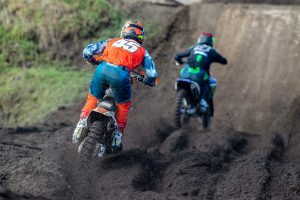 The final MX1 moto of the weekend contested in dry, hard-pack track conditions, resulted in another new race winner as lone factory KTM racer of today Clout took full advantage of a hole-shot to win on his 450 SX-F. Clout won the fourth outing by 1.063s following a late charge by Ferris, whose second was enough for him to clinch the overall via another consistent effort. The second eight-lap encounter in succession, behind Clout and Ferris came rookie star Evans, with Carter continuing his upswing for fourth. After running second through much of the moto, Long was eventually shuffled down the order to fifth, followed across the line by Metcalfe, Ward, James, Wightman and Davis. Overall for round eight it was Ferris the winner thanks to his 2-2 finishes, edging Clout by a point, with Long salvaging third this afternoon.